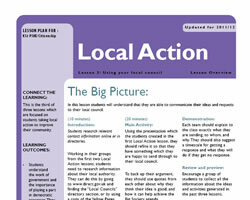 Help students to realise the importance of taking local action to help improve their community. 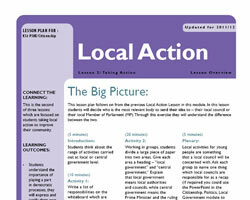 A series of 3 citizenship lesson plans and activities that teach students about developing and preparing a proposal to the local council. Once students have come up with some ideas, they then need to understand who they should send their ideas to at the local council. Students are encouraged to brainstorm ideas for improving their community. Students refine the presentation they created in lesson 1 to create something professional enough to send to their local council. As part of the citizenship curriculum programme of study, students should be offered the opportunity to work with a range of community partners and organisations to address issued and problems in the community. Combined with the requirement to understand how they can participate in decision making, this series of local action teaching resources will cover a number of the curriculum requirements. Students come up with a list of activities that they would like to set up. These must meet certain criteria and as a group, they must decide which idea to develop further . The class must now decide who the most relevant body would be to submit their proposal too. They will also be required to identify the relevant person within that organisation. In the final lesson in this module, the class must now prepare their proposal to the council. Students then present to the rest of the class for feedback. Suggested plenary activities are also included. 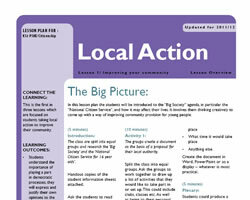 These local action lessons can be used to support learning outcomes for Community Volunteering Qualifications, Certificate of Personal Effectiveness (CoPE) - Citizenship and Community, Personal and Social Development Qualification - Community Action from ASDAN. These lessons are also suitable for use with Key Skills and Workplace Core Skills - Individual Rights and Responsibilities, Personal Development and Contributing to the Community from City & Guilds; Citizenship Studies - Active Citizens from OCR.